Gmail is undoubtedly one of the most popular e-mail services on the Internet with millions of active users across the globe. Google is constantly adding new and helpful features to it at a fairly consistent pace and it has become the favorite mail service for many of us. As our online contacts grow on a gradual basis, so does the inflow of business and personal emails in our inbox. 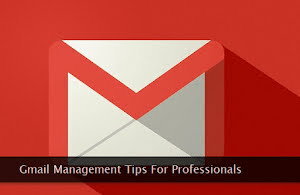 Let's see some useful Gmail tips and tricks to effectively manage our Gmail accounts. You can easily implement these tips to keep your Gmail inbox tidy and clean. My personal favorites among these tips are the clever use of custom filters which can help you automate a lot of tasks to clean up the influx of emails and spam. So, let's get started and try out these handy Gmail tips and shortcuts to use our email account in a better and productive way. It's all about creating the right mindset to use these powerful tricks for better email management which can easily help you in saving hours of precious time with minimum efforts. Let's tame our inbox! Almost all of the management tips mentioned below can be exercised with any additional add-ons or extensions. All you need is the knowledge of all the available options. If you're a new Gmail user, you may feel overwhelmed by the sheer number of options available within the setting tabs. If used correctly, one can manage the account—quite easily. Let's get started! If you receive different types of emails throughout the day on a consistent basis, a custom multi-tab inbox is the way to go. To do so, go to Settings → Inbox → Inbox type: option. Choose the Default inbox type from the drop-down menu. Thereafter, you can select or deselect the tabs you want to appear within your default inbox. I generally deactivate the Promotions tab because most of the advertisements appear in this tab. Once the multi-tab inbox is active, one can change its primary settings via the Configure inbox option too which is easily accessible through the gear menu. Initially, for a new user, this multi-tab inbox setup may feel odd, but within a couple of days, one starts loving it. It's a time-saver and keeps your emails segregated in groups. Filters are a powerful way to automatically take different types of actions on the arrival of emails. If used correctly and intelligently, Gmail filters can reduce your email processing workload—by many folds. You can create these filters through one of the two steps. Either use the search box interface (shown below) or go to Settings → Filters and Blocked Addresses → Create a new filter option. If you've created some canned responses, using them with the relevant filters can help you create a fairly good auto-reply system for select emails. I generally use these filters to either forward select emails to a different account or to apply custom labels for better management of the archives. Try it once and you'll never return back! If you're using your Gmail inbox for business email communication, activation of this feature is highly recommended. It can help you converse with your peers, customers, and clients in a timely manner. To activate this feature, go to Settings → General → Nudges option. Here, select both the checkboxes to get started. You can also opt to select your preferred option. The first option reminds about inbound emails you may have forgotten to reply. And, the second option suggests follow up reminders for the sent emails. In both the cases, emails are automatically analyzed and the ones needing your attention are presented at the top of the inbox with appropriate alert messages. You can try it for a week or a fortnight to assess its value and to feel its power to boost your business communication. Some of you may not be comfortable while using this feature. But rest assured because your emails are analyzed by automated systems without passing under a human eye. When turned on, this feature gives quick suggestions for replying. This speeds up the communication process for the most common situations and scenarios. You can accept or reject the reply suggestions. This feature can be activated via Settings → General → Smart Reply option. Sometimes you'll get multiple reply suggestions, and sometimes, you'll get a single one. I'll suggest testing this feature for at least a month before taking a final decision. If the influx of emails is substantial, the duration of the testing phase can be reduced. An important aspect of business email communication is the use of custom signature at the end of an email body. This helps in increasing the reach and visibility of the sender. Fortunately, Gmail provides a very flexible and user-friendly option to add a custom signature to the emails. You can take advantage of this facility through the Settings → General → Signature option. A rich-text editor gives you enough flexibility to create an appealing and attractive signature. Feel free to use both images and links to your social media accounts to get the best results. Apart from appending the signature in every new email, one can also activate the option of getting it appended to every reply within a conversation thread. I'm not a big fan of the latter option. Browsing email archive to find the required information is one of the daunting tasks for any account holder. Though email search does help, it cannot pull emails falling under a certain category. That's where Gmail labels can help you address this problem quite easily. Depending on your exact requirements, you can create a collection of custom labels for each type of email. Use a descriptive name and a custom color for each label to easily distinguish them from each other. You can create these labels either through the left side menu or you can go to the Settings → Labels → Create new label option. I always prefer the former option. When combined with the filtering rules, you can automatically apply these labels to the incoming emails. This way automatic segregation of emails can be achieved—quite easily. Generally, we use our Gmail account for that very email address associated with our Google account. But, believe it or not, Gmail service is much more powerful than that. What if you're allowed to use all your email addresses right within your Gmail inbox? This includes both custom domain email addresses and the addresses from external email services. The screenshot (shown above) clearly demonstrates how I am using different email addresses within a single Gmail inbox for the outgoing emails. At the time of email composition, I can select the desired email address (via drop-down menu) through which I want to send the message. And, in this second screenshot, I'm fetching messages from external email services. Both the facilities can be configured through the Settings → Accounts and Import tab. To give you an idea about the configuration of both the features, following is a tutorial one can use to get familiar with the entire setup process. If you've correctly configured all your email addresses through this facility, you never have to leave your Gmail inbox. That's how one can create a unified inbox—in its true sense. Despite having all the powerful features Gmail has on offer, some users just don't like using the web interface of this service. Instead, they prefer a desktop email application. Fortunately, there are several good desktop email applications avid users can choose from to get some added features for their daily email workflow. Here's a list of some powerful email clients. If you're going to use external email clients with your Gmail account, make sure to enable IMAP using the Settings → Forwarding and POP/IMAP → IMAP Access option. Always used a trusted email client to manage your Gmail account. Failing to do so may leave your account open to unauthorized access. I'd recommend sticking with the native web interface. Another powerful way to better manage your Gmail account is the use of add-ons and plugins. These add-ons add more power, flexibility, and features to your Gmail inbox. These add-ons are readily available via the Get add-ons option one can access through the gear menu. You can pick the required add-ons from the collection to complete the features you need for your email management routine. Go slow and do not try to use every add-on under the sun. Read the add-on reviews and its rating before trying it with your own account. If you're not going to use a specific add-on in future, make sure you've deactivated it. Professionals and business users will find this feature—very helpful. If you receive an overwhelming amount of business emails on a consistent basis, let your trusted contacts process them on your behalf. You can use this powerful feature by configuring the Settings → Accounts and Import → Grant access to your account option. The access given to the trusted contacts is only limited to email processing. They cannot access or change the account settings. So, if you're concerned about the account security, rest assured that this feature is absolutely safe. After granting access to a specific contact, if you're not happy with his work, just revoke the account access for him. G Suite administrators use this feature to divide their email processing workload.